Two hours after he was born at Rambam Health Care Campus, Gil’s legs were bound in plaster casts to correct a serious deformity. 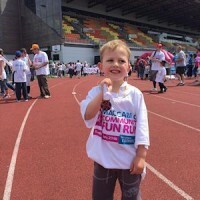 Lastweek, the four and a half -year-old ran in a race to benefit the hospital that got him up and running. 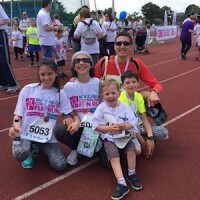 On June 19th, members of London’s Jewish community put on their running clothes for the traditional Maccabi GB Community Fun Run, a popular sporting and fund-raising event. Among them were young Gil Rustin and his family, who were running to benefit Rambam Hospital. Watching the happy and energetic young runner, one would never guess the long road Gil and his family had traveled, and that not long ago, he wasn’t even able to walk, let alone run. Thanks to the treatment and ongoing medical care Gil receives at Rambam, not only is he is up and running, but is dedicating his efforts to the hospital and doctors who have gotten him up and on his feet. Almost five years ago, Gil’s parents learned that their unborn child suffered from an extreme case of the common orthopaedic deformity known as club foot, where the feet develop facing inwards instead of straight forward. During the pregnancy the couple researched possible treatments, and found their way to Professor Mark Eidelman, Director of Paediatric Orthopaedics at the Ruth Rappaport Children’s Hospital at Rambam Health Care Campus in Haifa. Professor Eidelman, who has extensive experience in treating this, and other inborn deformities, counselled the parents that this was a problem that could be resolved, but that intervention would be needed as quickly as possible. With Professor Eidelman on standby, the child was born at Rambam, and only two hours after entering the world, Gil’s legs were encased in a plaster cast. After eight weeks, Professor Eidelman performed surgery to lengthen the Achilles tendons on Gil’s legs. The baby spent his first years with his legs in metal braces, the next stage in a treatment regimen that started at birth. Now, four and a half years later, Gil lives and thrives with no mobility limitations.